UV rays are not only incredibly harmful to the skin and eyes, but run the risk of damaging your vehicle as well. Protect your valuable investments using the PROSHADE sunshade. Our special UV resistant technology keeps your car cool and comfortable on hot sunny days. Our specially designed 210T fabric is thicker than other leading sunshades on the market to better protect your car’s interior from the damage of UV rays. 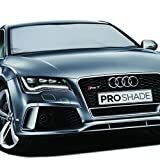 Trust PROSHADE to keep you and your vehicle protected. When you insert a PROSHADE sunshade into your car’s windows, you are protecting it against light and heat damage from the sun. No more cracking! No more fading! Keep the interior of your vehicle looking and feeling like new and feel confident that your investment is protected with PROSHADE. Our designers worked tirelessly to make a product that was as effective as it was easy to use. That’s why the PROSHADE sunshade is made to fit in a wide variety of cars: including Vans, Trucks, Compact Cars, and SUVS! We advise our customers to measure their windows before purchasing to ensure the perfect fit. Our shades are easily adjustable and incredibly versatile. If you’ve ever parked in the sun on a blistering summer’s day, you’ve probably dreaded getting back inside the scorching hot vehicle. In fact, surface temperatures in your car can surpass 195° F on a hot day (State Farm Vehicle Research Facility). In addition to being uncomfortable, the extreme heat can wreak havoc on your car causing damage to the interior-especially the upholstery. The heat in combination with UV light causes damage creating unwanted fading and discoloration over time. PRO Shade uses a proprietary reflective SUNSHIELD fabric that blocks UV rays, prevents sun damage and keeps your car comfortable.